Our General Assembly ended up taking place at a very painful time for many Americans, especially in the African American community. The Zimmerman verdict, while cheered by some Disciples, has thrown others into a kind of despair for our nation and our children, a sense that we are sliding backwards at a scary rate. The poignant question of the son of an African American Disciples pastor, “Will I be shot?” symbolizes the depth of fear and devastation that this situation has visited upon a whole community. In light of the fortuitous circumstance that the NAACP convention was right next to ours, that a number of our attendees were also registered there, and that several of our leaders participate in the National Religious Affairs Committee of the NAACP, meant that we Disciples had an opportunity to extend the ministry of presence with hurting brothers and sisters. 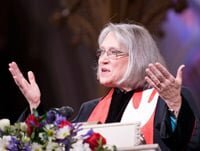 That a leader of a predominantly white denomination could stand before the convention and say that we, too, believe that children should not be lost to violence, that we, too, desire to be assured that justice is reached in this case, gave a moment of hope that our nation is not totally divided and polarized along racial lines. That a delegation from our assembly later went to stand with members of the NAACP gave encouragement that we can see this through together. The NAACP voted to suspend their meeting rules to accommodate our presence. When three people from the National Religious Affairs committee, including a Disciples pastor, wanted to return the favor of bringing greetings, it seemed the natural thing to do and we arranged for them to speak during the pre-worship time. As it turned out, they were not able to accommodate our pre-worship time so we received them later in the order of service. It is quite possible that in the end this will make extra work for you. Still I believe it was a providential moment to make a witness to our “passion for justice,” to a desire to overcome the terrible brokenness represented by the verdict and the various reactions to it. I have attached my remarks at the service on Sunday night. Perhaps they can be helpful. Thanks for all you do in interpreting the various ministries of our church to each other. Something happened in the Zimmerman verdict that Affects us all. In this gathering tonight we may not have the same opinions on what probably happened that night But we are a pro-reconciling/anti-racist church. Anti-racism says we have to suspect that racism and profiling was involved and is involved. There’s something about guns here, too; something about a culture of violence and death that believes what’s mine is worth more than your life. That culture of violence affects us all. Pro-reconciliation says we have to reach for a better place. Our preacher last night told us – not to act out of fear. Our preacher this morning told us that we, like the original disciples, can come across demons that can only come out through prayer. Not easy prayer-like words, but deep communion with God to where God breathes through us and acts through us. An eight year old boy in the midst of all of this, the son of a Disciples pastor, an African American child, asked his mother, will this happen to me?? That child is our child –This affects us all. Reconciling God, reconcile us that we may be ministers of reconciliation for this broken, hurting world. Work your miracle in us that our words, our hands, our actions may bear your healing power. Work your miracle through us that the world will know your justice and peace. Teach us to pray the kind of prayer that casts out the stubborn demons, the ones that dwell deep within and refuse to set us free. Teach us to pray the kind of prayer that defeats hatred by the power of love, that overwhelms suspicion with compassion and confidence in your loving care, the kind of prayer that brings life from death and hope from despair. Teach us to pray the kind of prayer that brings us into your heart of justice and the joy of your abundance and love. Make us ministers of your reconciliation, bearers of justice and love. who reconciles the world to you.